I got a nasty case of start-itis over the weekend. 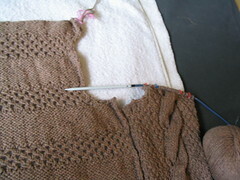 I had been knitting away on the right front of my $1.50 cardi, when I decided to hold it up against the back piece. The armholes were at totally different heights. I was suddenly thrown off my “this-will-be-the-best-knit-ever” horse. 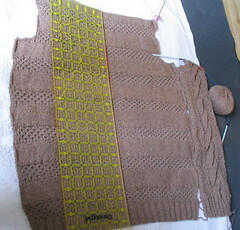 Then I realised that the back was all crinkly and shrunk from the stitch pattern, so I stretched it and measured. The front would also be a different size when blocked, so I tried to stretch that too. I didn’t have enough hands. So I decided to block the back piece to make measuring easier. Even with the back all blocked, the front armhole still starts lower. But then again, the front needs to be stretched too, to open up the lace. I hope that between stretching it up and sideways, it’ll grow that little bit it needs. If not, oh well, I’ll just frog back. I’m also getting slightly concerned about running out of yarn, but we will not speak of that. Friday these length worries had gotten to me, so I found a ball of sock yarn, and brought that and some needles to work to swatch for the Sidewinder Socks. I got gauge, but couldn’t actually start at work, as I had no waste yarn, and I got gauge on needles I only have as DPNs. That was put away until I could get to my LYS. So Friday night, my cardi was blocking and awaiting analysis, my LYS closed before I got off work, and my boyfriend was at work. What’s a girl to do? 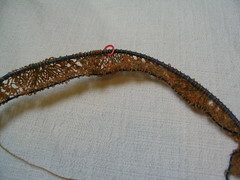 Cast on for a lace shawl, that’s what! It’s the Large Rectangle in Leaf and Trellis pattern from Victorian Lace Today (on page 54). 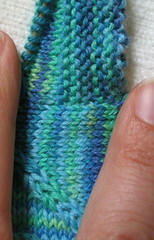 The pattern calls for a size 6 needle, but my yarn is a bit thinner, so I started on size 5s. I knit a bit that night, and a bit more at work on Saturday. I got 9 rows done. Sunday, I went to my LYS to pick up a needle for those Sidewinders, and a needle for the shawl (my Denises were snagging the yarn at the joins). Addi (which is the circular line they have) doesn’t do 2.25mm needles. bah. I picked up a 2.0mm instead, as with socks, you should probably err on tighter gauge than looser. Then, while looking at the bit of shawl I had knit with Amy, I realised it was much, much too open for my tastes, so I bought a 3.25mm (US 3) for that one. Sadly, they had none of the lace Addis in that size. I bought a Natura, because I do like the bamboo. So I got home, and cast on for the Sidewinders, and worked on that for most of the rest of the day. I don’t want to leave the cardi behind in the dust, but the different sizes and stitch patterns and blocking sizes were making my head all exsplody. This entry was posted in Knitting, Lace, Socks, Sweaters and tagged dollar and a half, sidewinders by rycrafty. Bookmark the permalink. I’m loving the looks of that shawl. Yay google is my king assisted me to uncover this outstanding internet site ! .